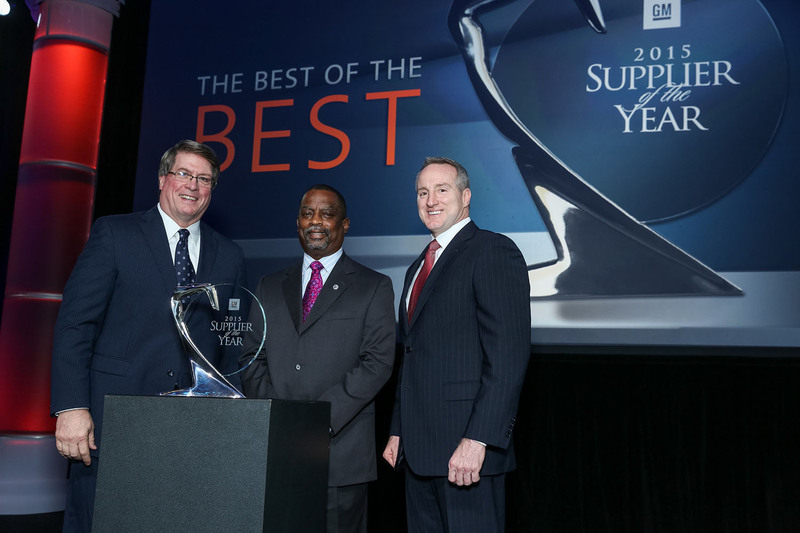 (SOUTHFIELD, Mich., March 14, 2016) – Michigan-based chemical management company ChemicoMays was named a GM Supplier of the Year by General Motors during its 24th annual Supplier of the Year awards ceremony held Thursday, March 10 at Cobo Center in Detroit, Mich.
GM recognized 110 of its best suppliers from 17 countries who have consistently exceeded GM’s expectations, created outstanding value, or brought new innovations to the company. The announcement represented the most suppliers GM has recognized since debuting the Supplier of the Year event in 1992. This is the seventh consecutive time ChemicoMays has received the award. “I started this company more than 26 years ago with one mission in mind — to add value to our customers supply chain. It’s customers like General Motors who have for the last seven years given us the opportunity to add value to their global product and performance achievements,” said Leon C. Richardson, president and CEO, Chemico. About ChemicoMays: ChemicoMays specializes in providing an integrated solution for the chemical lifecycle – from sourcing and procurement, to lean hands-on management, through environmentally conscious disposal. Founded in 1989, the organization has continued to experience positive growth year over year since its inception. ChemicoMays serves customers across a variety of industries including automotive, aerospace, biotech and pharmaceuticals. ChemicoMays is a part of the Chemico Group, which operates more than 50 sites throughout the U.S., Canada and Mexico. Chemico customers include General Motors, Fiat Chrysler Automobiles, Ford, Toyota, Amgen, Delphi, Honeywell CR Bard and Maxion Wheels Mexico. For more information, visit www.chemicomays.com.